And oh, there was unbelievable fruit. 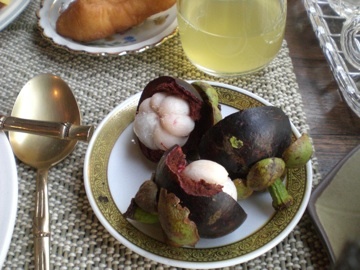 On my first day in Thailand I got obsessed with mangosteen. I'd never seen it before, but it's beautiful, slightly smaller then a tennis ball with a smooth thick purplish shell, capped with a bright green stem. Once you crack the shell open, there's a beautiful contrast between that purple and the white sections of fruit inside. It looks like the moon and tastes sweet and tender. Moonlike, it is known in the region as the queen of fruits, as a cooling fruit to be eaten along with durian -- a.k.a the king of fruits -- to counteract the durian's heat. (Later, I tried and hated durian. It wasn't the infamous smell, it was the custard texture.) I'm going to miss mangosteen back in North America but it's reassuring to be reminded that not all fruit has yet been bred and/or packaged into standardized, monoculture products that are universally available during all seasons and across all distances. All of us at the Smart Museum are hugely grateful -- dancing-around-the-office-grateful -- to have received an Emily Hall Tremaine Foundation Exhibition Award for Feast. It's a wonderful grant: the foundation's exhibition awards are highly competitive, substantial, flexible, and designed to provided early support for experimental, thematic contemporary art exhibitions. By covering a significant portion of the exhibition cost, the grant allows us to move forward confidently with the project even given the current economic crisis and the fundraising challenges facing all museums. I mention this not only because a shout out is due to the Tremaine Foundation, but also because I'm in the midst of the first of two brief research leaves for the project, and my travel during this time has been partially supported by Tremaine funds. This time away from administrative work at the Smart has been a rich experience for me personally and one that has helped expand the context of the project. Most of the artists on my initial working checklist -- the list that won the award -- were either a) European, b) American, or c) Asian artists working in Europe and America. I've been expanding that initial list quickly: usually as soon as I mention the project to an artist or another curator they say, oh, do you know about so-and-so who is doing such-and-such with the meal? But because most of my network of colleagues are European and American, up until February I learned mostly about other artists working in those same territories. That's great, of course, and I hope to keep learning about Euro-American work on this topic (about which I'll write later). But the show needs a broader viewpoint, so I cashed in some frequent flier miles and spent much of the last five weeks on research leave in Southeast Asia. This allowed me to meet a number of artists who work with the meal or who had related things to teach. We talked about their work and its connections both to their individual practices and to their specific working contexts. They took me to artist-run cafes, to archives, to other artists, to local spots for favorite dishes. (No surprise that many productive conversations took place over coffee, over drinks, over meals.) They arranged invitations for me to help prepare food in humble village kitchens and took me to see the ritual pomp of the sultan of Yogyakarta's gift of food to the people. This experience of "other" places/art communities/foods/modes of hospitality has helped me to shift some patterns of thought and to widen the circle. (And yes, for most of the time I was in the tropics, it was gray winter in Chicago, and yes, I added some vacation time in the mix, and yes, I know that I am a lucky person). In 2012 there will be feasting in Chicago. The act of sharing food and drink with others is a basic human pleasure and an enduring source of aesthetic inspiration. Today, the shared meal has become a compelling artistic medium: a surprising number of artists are using meals to advance aesthetic goals and foster critical engagement with our current culture. These artist-orchestrated meals can offer a radical form of hospitality that punctures everyday experience, using food as a means to spark encounters and perceptions that aren't otherwise possible within our fast-moving and overly segmented society. Feast: Radical Hospitality and Contemporary Art surveys these practices for the first time. Through a series of new art commissions in public spaces and a presentation within the Smart Museum, the exhibition will introduce new artists and contextualize their work in relation to some of the most influential artists of the last century, from the Italian Futurists to Gordon Matta-Clark and Rirkrit Tirvanija. Feast addresses the radical hospitality embodied by these artists and the social, commercial, and political structures that surround the experience of the shared meal. I've chosen a few of the artists and works for Feast but am still in the "casting-a-wide-net" phase of research. There are more artists working with the meal than I had imagined when I first proposed this exhibition, and as I gather more and more information about artist-orchestrated meals around the world, I'm trying to understand how the meal fits within in each artist's practice and how it relates to their individual preoccupations. I'm also curious about whether trends will emerge and if strong connections will become visible within and across different generations and locations. (This is for the contemporary material; the historical sections are smaller and already more tightly formed.) And of course, the research process has to yield an exhibition in the gallery as well as in public sites, one that holds together conceptually and physically and brings out the best of the artists' projects so they hold their own while also supporting the overall thematic framework. This blog will be one place to track research, analysis, and musings. Discussion notes about relevant texts: art histories, food histories, calls for massive structural change our current Euro-American food supply system, theories of hospitality and its importance in contemporary society, etc. Travelogues; notes from informal "Kitchen Cabinet" planning dinners that will bring a diverse group of colleagues together for discussions leading up to the exhibition; brief discussion of relevant artists, projects, and places; pictures; excerpts from interviews; recipes, etc. Notes about the logistical challenge of transforming the research into an exhibition, public projects, collaborative public programs, related courses, and a book. Short posts on related topics from artists, writers, Kitchen Cabinet participants, etc. A call out to artists, curators, scholars, students, interlocutors, critics, locavores, chefs, shopkeepers, salonistas, activists, everyday cooks, backyard gardeners, farmers' marketers, Chowhounders, LTHForumers, etc: please share your thoughts about the blog and the project. I'd love to hear from you if there are other artists, books, meals that I should know about, or if you have incisive critique or suggestions. This page is a archive of recent entries written by Stephanie Smith in March 2009. Stephanie Smith: July 2009 is the next archive. This is an informal curatorial research blog for Feast: Radical Hospitality in Contemporary Art, an exhibition about the meal as a medium for contemporary artists. The exhibition opens at the University of Chicago’s Smart Museum of Art in February 2012.